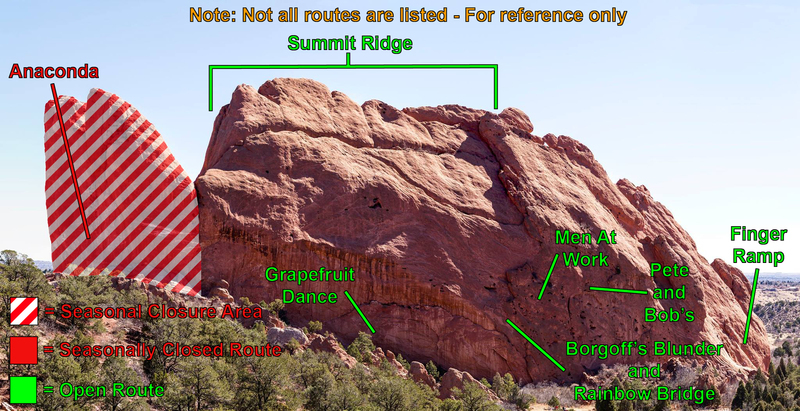 The large rock formation just north of North Gateway Rock is called South Gateway Rock. There is a lot of good and very varied climbing here. The Drug Wall stays in the shade most of the time and has one easy and several hard slab routes of very high quality. There are also good easy to hard crack climbs up to 3 pitches long, and a nice toproping area. Walk past North Gateway Rock from the main parking area. 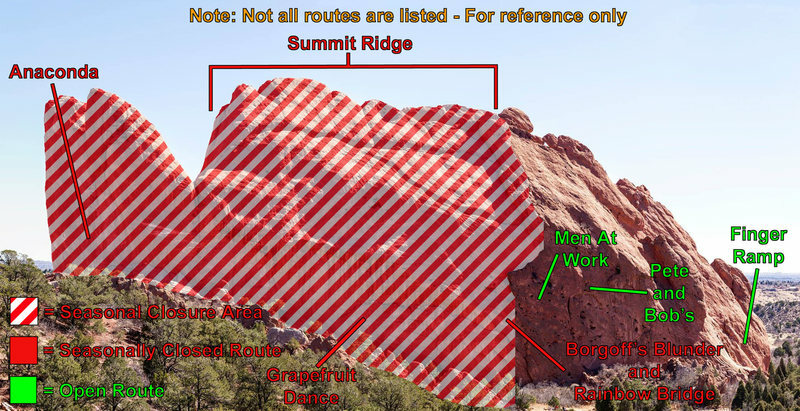 South Gateway is the very large rock formation just across the paved trail. The beautiful South Gateway Rock. In mid-May, 13 Colorado Springs climbers closed off several of the social trails that access the Drug Wall base on the northeast side of South Gateway Rock. 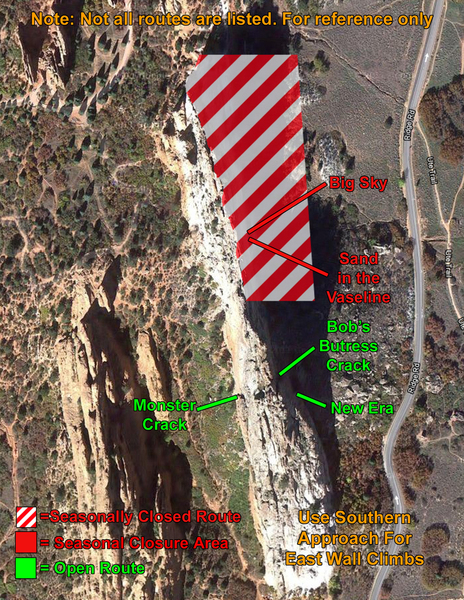 The new access trail to the cliff-base is a short path that leads to the base of Crescent Crack. Follow the cliff-base east from here to Silver Spoon and the Slice bouldering area. The deeply cut trails below Silver Spoon were filled in with brush and rocks. 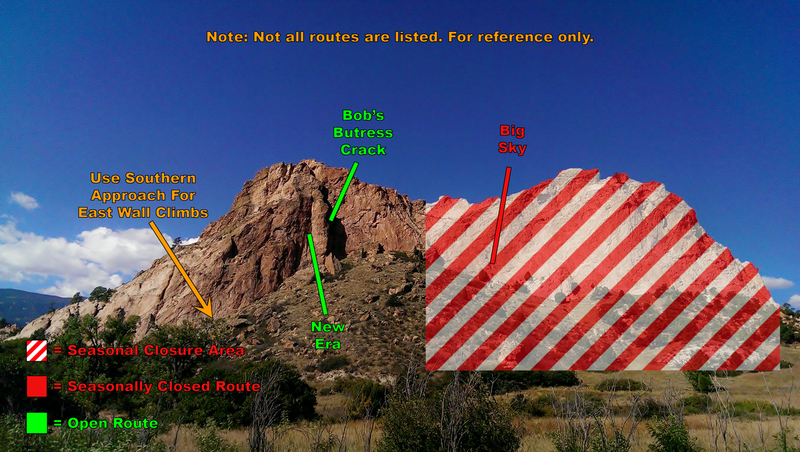 Do not use these old trails so they can rehabilitate. 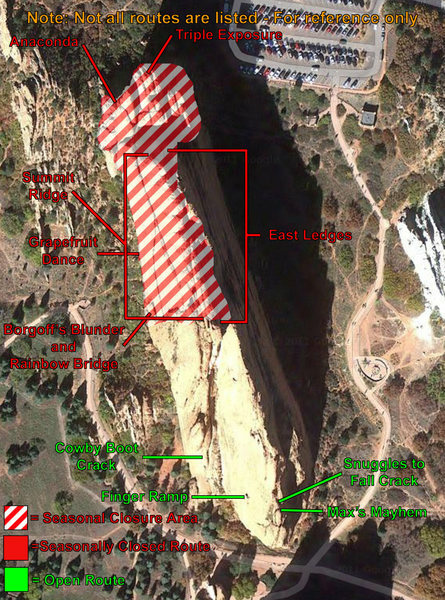 The Colo Spgs Park & Rec Dept wants less trails to access this and other climbing areas in the Garden. The trails will be designated with city signage in the future. Look for new access trails to the west side of South Gateway, including West Point Crack and Credibility Gap, as well as marked trails to the Finger Face and Cowboy Book Crack area. 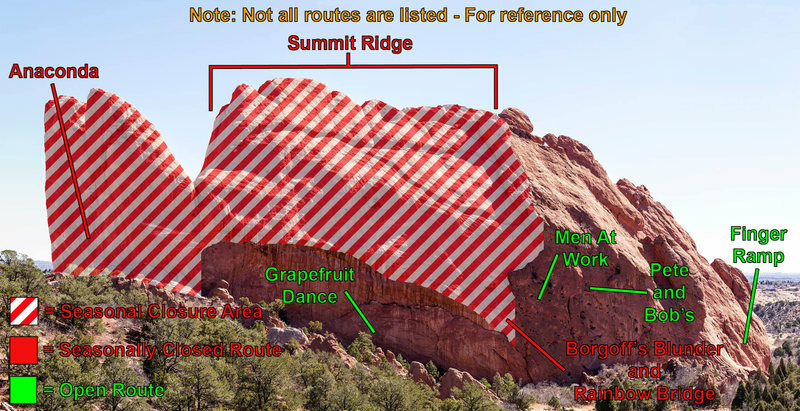 Joel, it sounds like you're referring to the Indian Head route, which continues above the piton, hugging basically the left side of the white rock where the white rock meets the red rock. The upper portion climbs up sort of a groove, which you can see from below. 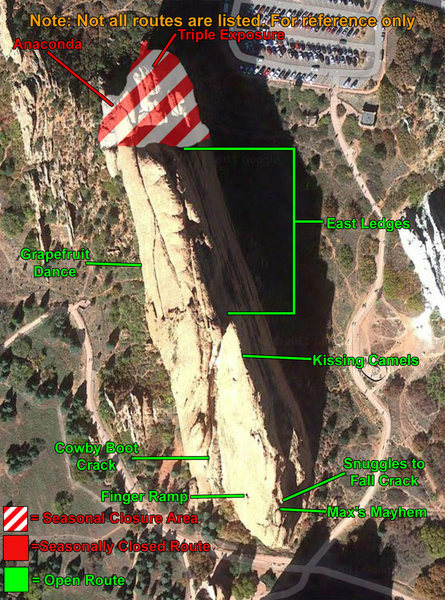 The route is named after the formation of the Indian Head which is formed by the white rock, and shows the profile of an Indian looking to the north - obvious if looking from a distance. FA was done by Steve Hong, Ed Webster, and Earl Wiggins in the '70s. The climb has probably seen few ascents as the upper portion looks quite loose.